From the Canyon Edge: Byobu Custom Status Notifications in 3 Easy Steps! Byobu Custom Status Notifications in 3 Easy Steps! Many Byobu users have asked me for this sort of functionality over the last year -- the ability to add custom status items to the lower bar. I'm pleased to announce that this is now possible as of Byobu 2.40+! After upgrading Byobu, you can create your own custom script, in 3 easy steps! I run a lot of KVM virtual machines on my Ubuntu servers, usually through the Ubuntu Enterprise Cloud and Eucalyptus. 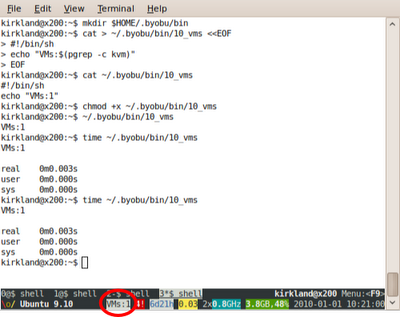 At any given time, when I log onto a Eucalyptus Node and automatically launch Byobu, I'd like to know how many virtual machines are running on that system. So I create a simple shell script that does something like this -- grep the process table for kvm processes and echo a count of VMs running. Now, let's add this to my Byobu status bar! Note that I called this script "10_vms". The number "10" is the frequency in seconds you want Byobu to refresh this status item. You need to be careful here, making sure that your status program doesn't gobble too much CPU! Choose this number carefully, and consider how often the information displayed is likely to change. I recommend running "time" on your script a few times, seeing how long it actually takes to run. My example is trivial, and executes within 0.003 seconds on my system, so running it every 10 seconds is still relatively inexpensive. Your script might be much more complex, and may not need to be run as frequently! And within a couple of seconds, it should show up in your status bar! You can put as many of these as you want in your $HOME/.byobu/bin. You can enable/disable each by changing the permissions, adding or removing the executable bit (chmod +x or chmod -x). You can write your custom script or program in any language, as long as it's executable and emits something on stdout. i'm going to test it asap! keep doing byobu better , i love it !! !